The front yard is a unique area in our homes. It is where our private property intersects with our neighbors and communities. Too few people homeowners realize their front yard's potential. Shawn and Blinda discuss how to make the most of this neglected real estate. Before you build a pool there are some things you should consider: Mainly, most of your time will not be spent in the pool; It will be spent around it. This consideration should inform a solid, comprehensive backyard design. Shawn and Blinda have made a name for themselves owning and operating Houston's premiere landscape design firm, Mirror Lake Designs. But more and more, homeowners are turning to YouTube, Pinterest, and other sources to facilitate their need to DIY their own backyards. In this episode, Shawn lays down the basics of sand-laid paver patios. With enough children and grandchildren to fill an entire baseball roster, Shawn and Blinda know a thing or two about how to entertain and delight children in their garden. From wacky Dr. Seuss-like plants to delicious edibles, you too can introduce your children to the wonders of your own garden. Shawn and Blinda chat with John Ferguson of Nature's Way about how to best create your own at-home compost pile. After all, now is the time to do it in preparation for spring plantings. Plus, you'll be surprised how composting can affect how much and when you water your plants. It may be 105 degrees out, and you may be looking for a cool retreat out in your backyard. Is it possible? Yes! With a little imagination and the right materials, you too can enjoy your backyard in these dog days of summer. A Landscape Architect? What the heck is that? Most folks don't even know that a Landscape Architect is a profession. Their only experience, after all, is with pool builders and pool contractors. But there is a huge difference between the landscape architect, and a guy with a shovel. Let Texas Registered Landscape Architect No. 869 (Michael Shawn Kelly) explain the difference. There once was a time when we would spend our evenings out on our front porches. We would enjoy a beverage as the sun set, and wave as the neighbors took a stroll around the block. Smart, beautiful landscape design can help you reclaim your front yard. Shawn and Blinda tell you how. 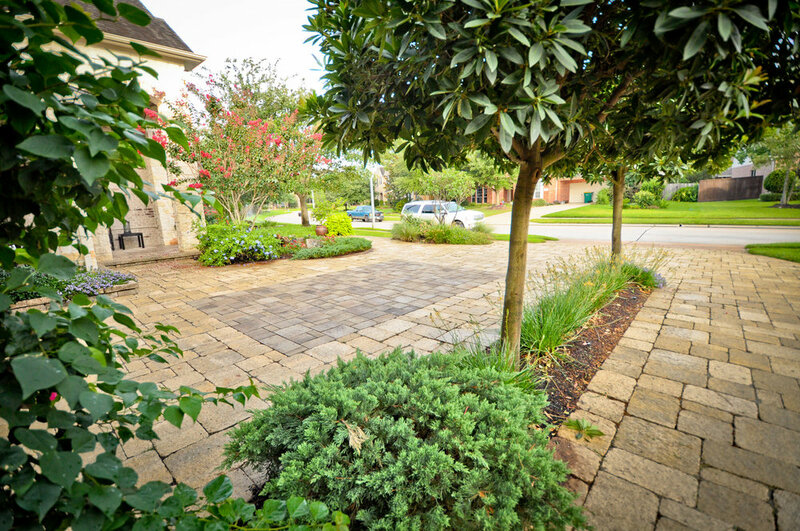 We are surrounded in the Houston area with subdivisions of two-acre lots. Typically, these homes are built up several feet above native elevation. The intention is good - to keep the home dry. But too often, the homeowners and the builders themselves do not know how to mitigate the unforeseen consequences. Sometimes shifting your perspective will allow for design possibilities to flourish.